At last a fine morning here at 45°S. Despite the weather experts saying we are in for a drier, warmer spring summer we have only had 3 fine days over 2 months and almost constant rain. Off to Central Otago with all our boys for Xmas day and hope to see sunshine. The forecast is good through Central for the next couple of days – if you don’t mind some dry heat. One 1ewes last night they were forecasting crap weather for the North Island and good weather for the South. Pretty slack of them I thought. Definitely the Labour lead Government’s fault! I’ll tell the pooks ! 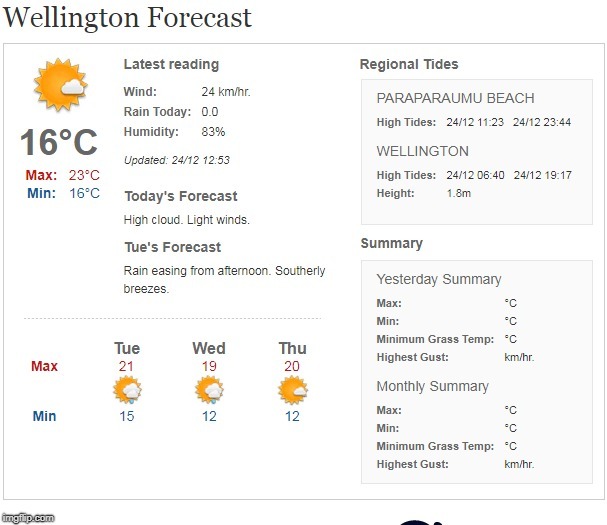 Actually Welly’s weather forecast doesn’t look too bad. Ma was waffing on about something gossipy when 1ewe’s weatherperson was giving a horror forecast for the North Island – but he must’ve been talking about the Bombay Hills and northwards or something. WTF’s wrong with these idiots? Auckland’s just a bloody city. Inferiority complexes liek his are a pain in the arse, imo. I wonder who she inherited that from. Your godpook is growing up ! He is taking on responsibilities. For the last two days, even if he is on his own, after whining endlessly for attention & for wheat, Alex is then going quiet & sneaking all his bread chunk treats away to the hidden nest, like the adults do. Not sure whether this means the arrival of Xmas newborn(s) [I can’t hear any pooklet baby cheeps} or whether they are just making sure the pook on nest-setting duty is not forgotten at treat-feeding time. I need to start thinking of nativity-related pooklet names. Those are related to the Nativity without being sacreligious. Kawa or Hutu from Pohutukawa ?